Diagonal lines create movement and action. They move the eye from one element to another and can be used to move the gaze upward or downward, depending on the direction of the diagonal. In Western cultures, because we read left to right, the left to right diagonal moves the gaze upwards (towards the face). The right to left diagonal moves the gaze downwards (towards the hips or ground) and has a more negative feel. Now for the men in your life – his tie should also have an upwards (left to right) diagonal stripe to draw attention up to his face. 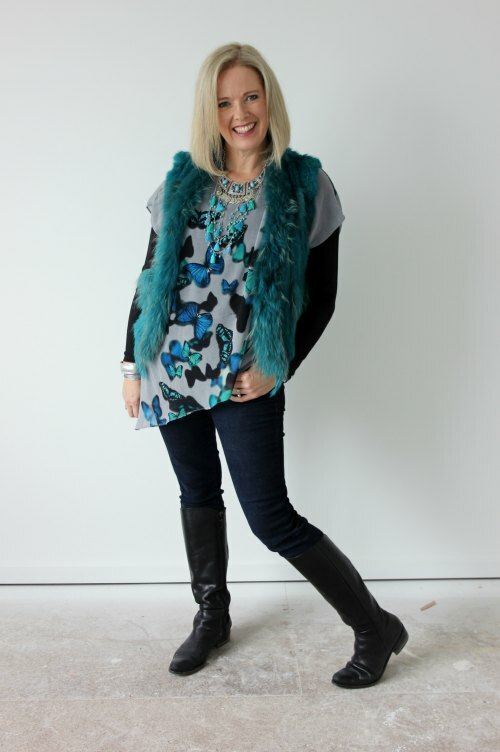 So how about V Necks – they are one of the most common diagonal lines found in clothing. 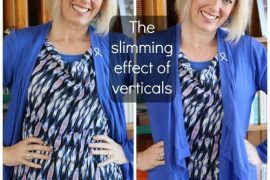 The more the V is vertical, the more it behaves like a vertical line, though direction may change depending on the width. 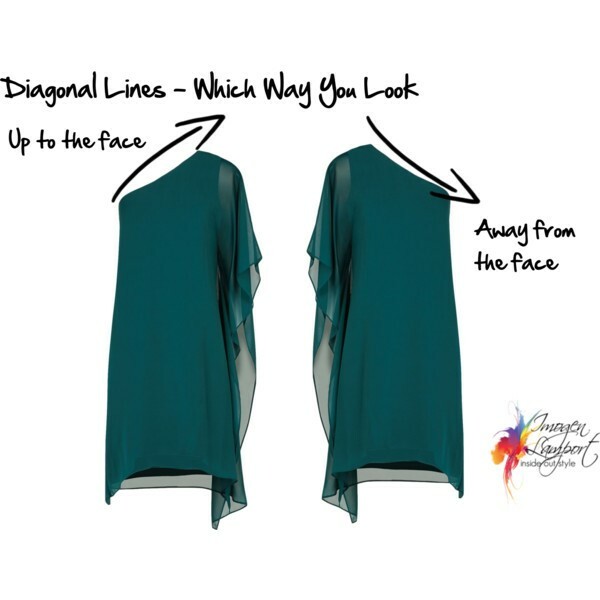 A medium diagonal will draw the eye upwards (such as a standard V neckline). A narrow diagonal will draw the eye downwards as it becomes more like a funnel. A wide diagonal will draw the eye outwards and behaves more like a horizontal lines and broadens (read more about horiztonal lines here). 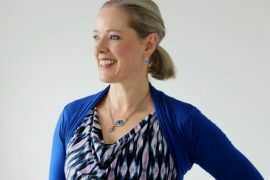 Halter necks and raglan sleeves (like the top left dress in the pic above) will narrow a broader shoulder. The middle dress will broaden shoulders, but also, becasue of the second lower V shape, will make the rib cage and bust look larger. 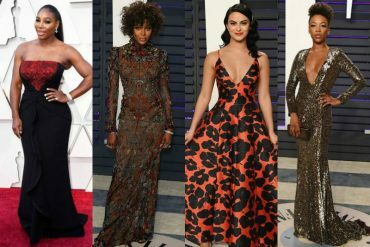 If you want to add curves, look for diagonals that are narrower at the waist and wider below and above, like the third dress above. 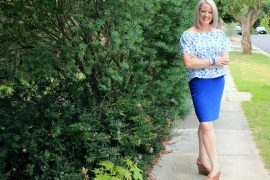 A diagonal hem is a great way to avoid adding an extra horizontal line across a wider part of your body and to your outfit too! Just wanted to tell you how useful I am finding this series. Many thanks! Another thing I’ve noticed is that short sleeves cut on the diagonal are much more slimming to the upper arms than sleeves that are cut straight across the arm. 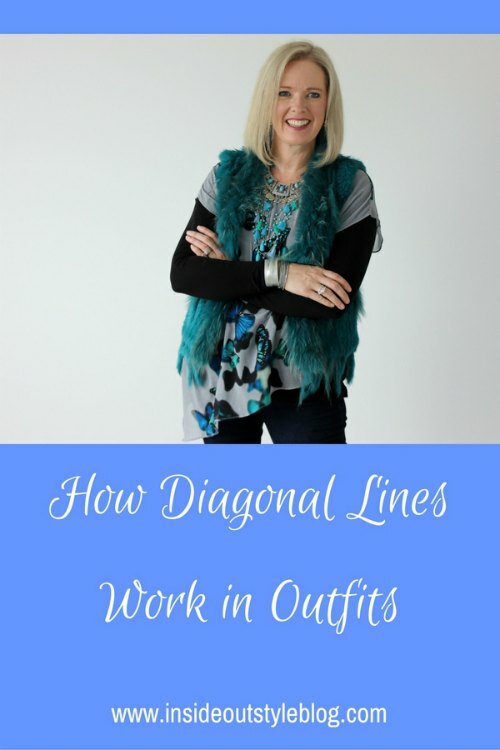 Absolutely – any diagonal hem takes away from the hem being horizontal and more broadening! I guess that a diagonal hem (short sleeves) are good if you are big busted, isn’t it? Did you realise that the direction of stripes is different in the UK, to US? Where does Australia fall? I have a question- you say that the left to right diagonal moves the gaze upwards (towards the face). It’s always be seen from the person who looks at another not the person who is wearing the dress. So the fabric on the shoulders is on the left shoulder, isn’t it? Yes it’s frome the viewer’s point of view not the wearers! Am I right in thinking that looking at your reflection in a mirror might be deceiving for this trick? 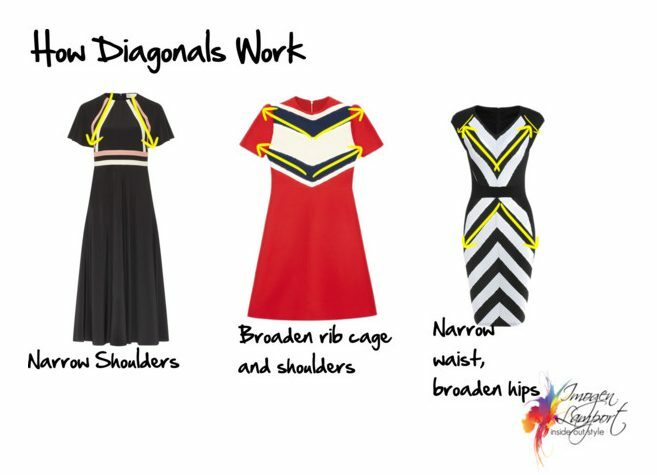 If diagonals follow the way our culture reads…in my case left to right, then if I have a tunic cut on the diagonal like the one you are wearing in the picture above, that will draw the eye up to the short point by your hip right? 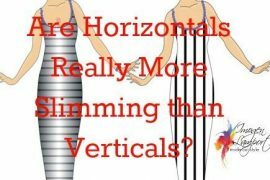 does this mean that a halterneck widens bust and narrows shoulders because of the diagonal line? If so, does this apply for high necked halters too?